ChemSoft Classification forms the core module of the ChemSoft suite of regulatory compliance modules. ChemSoft Classification accurately calculates all regulatory information for preparations from a formulation containing combinations of single substances and intermediates. The systems regulatory databases are contained within this module and once a formulation has been classified, a compliant supply label is available. ChemSoft Classification utilises global regulatory databases, directives and regulations to ensure that accurate regulatory information is calculated and products are classified in compliance with the regulations of where the product is being sent to. 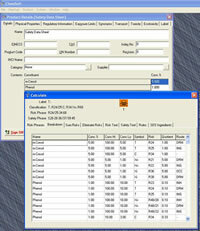 In addition to the standard rules for classification, users may create their own classification calculations to allow for the addition of valid test data for products and raw materials. Formulation data, information on raw materials, physical data, toxicological data, ecotoxicity data and transport data can be either imported or ChemSoft EH&S will link directly to external data sources to allow automated data access from MRP/ERP systems. Whenever there is a change to a product the impact on the classification must be considered. Changes may occur from a variation to formulation, receiving a revised classification from one of the substance manufacturers or a change to legislation. ChemSoft Classification constantly monitors changes to substances, intermediates or new pieces of legislation that may affect the classification of a product. As soon as data has been changed the user is alerted via an on-screen menu advising them on how they should implement the change to any affected record. Users are given the option to globally update any affected products and allow the system to reclassify all affected records. These records will all receive new revision numbers and the changes will be logged and archived for future reference. Users may also select to monitor the upgrade process and can select groups of records to update globally, then select individual records to manually update at a later date. Until the system has successfully completed the upgrade process, users will be warned that the classification may not be up to date each time they open a record that has not been reclassified.